This package contains a hard copy printout of the following book and its companion Book on CD. In addition, a free Electronic Download Edition will automatically be added to your order. No delay - start working right away! The moment this book arrives, you will know you made the right decision because you have full color for the price of black and white at the copy center. Your choice of Spiral Binding or loose pages, 3-Hole Punched, ready for insertion in your own 3-Ring Binder. A CD containing the full contents of the book in PDF format. 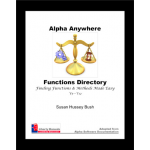 The PDF is searchable, printable and includes the Table of Contents and Index. Great for hitting the road. The working database(s) for the exercises in the book. A free copy of the Electronic Download Edition so you can get started immediately. Automatically added to your order. This is part two of a three volume set. 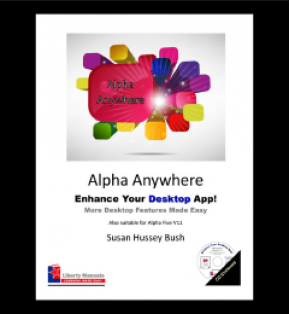 Combine with Alpha Anywhere Made Easy, The Basics and More and the Report Writer and save! Better yet, bundle them with the Functions Handbook to take full advantage of the software and save even more! This is part two of a two volume set. Combine with Alpha Five Made Easy, The Basics and More for V11 for a dynamite application! Better yet, bundle both with the Functions Handbook to take full advantage of the software and save even more.